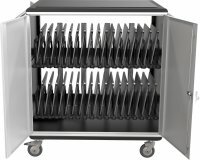 Black metal adjustable rolling audio visual (av) utility cart with locking cabinet and electrical outlets. Also has keyboard shelf, mouse shelf and two side shelves. Steel contruction with roll formed shelves with powder coat paint finish in black. 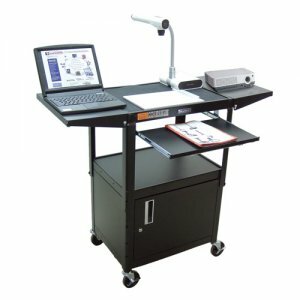 Adjustable height from 24 inch to 42 inch in 2 inch increments. Tables are robotically welded. Cables pass through holes. 1/4 inch retaining lip around each shelf. Three outlet, 15 foot UL and CSA listed electrical assembly with cord plug snap. 4 inch ball bearing casters, two with locking brakes. Non-skid safety mats to prevent equipment from sliding.